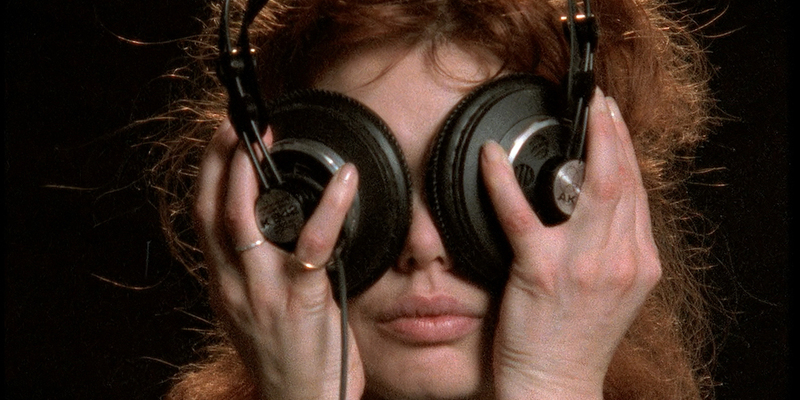 Chris Marker, The Owl’s Legacy, 1989, 16mm/35mm/video to DCP, color, sound, 350 minutes. 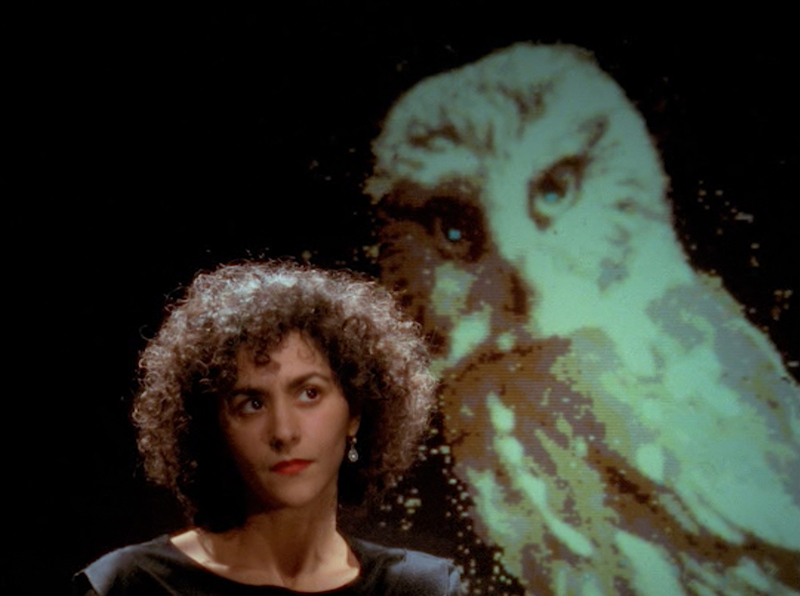 The Owl’s Legacy, released in 1989 and now screening at Metrograph in its recently restored version, has none of Sans Soleil’s nimble reserve. It is talky, pedantic, and adorable. I love it. Commissioned by the Onassis Foundation, which promotes “Greek culture from antiquity to the present,” the documentary is a thirteen-part miniseries on ancient Greece made for public-access television. This production history is a Mad Libs of early neoliberal cultural production: wacky cinema for a mass audience thanks to private money and public funding that would be functionally decimated in the aughts. The craggy freedom of not having to hustle for an audience or financial backers is, like a garment deliberately worn flowy and loose, felt gesturally. It’s in the extra time allotted for the camera to pivot around a banquet table of watermelon slices, red wine goblets, and . . . academics, graced with a moment to deliberate before being required to speak. These are not yet the self-consciously floundering hyper-specialists of twenty-first-century academia. But they are also not “public intellectuals” gathered in the “public sphere” as Jürgen Habermas imagined it: as a twentieth-century British coffee shop in which anyone could walk in regardless of class (but not race or gender) and debate, as the group (structured but not cliquey!) watched individual concerns collate into public interests and discourses. These banquets are instead styled after Plato’s Symposium, in which notable speakers including Socrates gathered to discuss Eros. In The Owl’s Legacy, each twenty-six-minute episode is dedicated to a single word inherited from the original Greek: nostalgia, democracy, myth. Interspersed with these symposia are talking-head shots with individual philosophers and scattered artists, such as director Elia Kazan and singer Angélique Ionatos. To undercut pretentiousness, Marker custom-designed an owl sculpture for each speaker, which is projected onto a wall behind them or seated on a nearby coffee table. Athena, the ancient Greek goddess of wisdom, is accompanied and often symbolized by owls, which were also one of Marker’s favorite animals. (The other was cats; when asked for a photo of himself, Marker would usually give a headshot of his beloved tabby, Guillaume-en-Égypte.) The thesis of The Owl’s Legacy is that Western Europe has variously used and misconstrued the legacy of ancient Greece for its own political aims. While Sans Soleil focuses on memory’s inherent fallibility, The Owl’s Legacy is more concerned with how history is deliberately misread. Chris Marker, The Owl’s Legacy, 1989, 16mm/35mm/video to DCP, color, sound, 350 minutes. Angélique Ionatos. In her introductory remarks to “True Lies, Deep Fakes,” a recent Rhizome panel discussion that she co-organized with Lauren Studebaker, artist, writer, and curator Aria Dean looked at how the issues of reality, history, and truth-production had been modified by the internet. “Helped along by aggressive social media algorithms, propaganda bots, deepfake AI technologies––to name a few factors––the characteristics of the postmodern condition offered by Lyotard and others, where grand narratives come under suspicion and are replaced by localized subjective ones, has given way to a more grotesque scenario where these localized narratives have stiffened into totalizing, grand narratives themselves.” One pleasure of watching The Owl’s Legacy is its image of what postmodernism was supposed to be. Academics, pleasurably miffed, debate common premises while eating green grapes. History is constructed, but in a way that feels okay. A plurality of experiences (or at least some of them; Marker’s cast skews white and cismale) is given a literal seat at the symposia, nestled in the comfort of a shared reality from which participants can deviate as they like. It is cheeky, self-conscious fantasybut at least Marker was in on the joke. As Dean later pointed out, a desire for this vision of postmodernism can too easily relapse into a craving for so-called objective truth, as well as a sense of misplaced tragedy at its imagined loss. The Owl’s Legacy runs from November 9 to November 15 at Metrograph in New York.